Music has been a journey for Lovey Forbes. Songs and sounds have carried him from his North Caicos beginnings, where he grew up hearing local gospel and country music on the radio, to other countries and cultures, to meeting new people, to exploring his own feelings and faith, to seeing beauty in all of creation. Ultimately, though, the music has carried him back to his home and himself. When I first interviewed Lovey for this magazine in the early 1990s, we called him the Islands’ “troubadour,” promoting the Turks & Caicos in song. More than 20 years later, he is all that and more. He not only has found a way to make a living in music, but also has become a model for other TCI musicians and for volunteer community service. When his family moved to Freeport, Bahamas in the 1960s, he followed Bahamian musicians and broke into that scene, influenced by calypso, reggae and American rock-and-roll. At the time a keyboardist, he was invited to join Smokey 007 and the Exciters, one of the most popular bands. The association was mutually beneficial. The band improved Lovey’s musicianship, and he added showmanship to their performances. He recalls the night he broke through and found his own style. “Freeport was our base, but one night we made a trip to Bimini” for a gig. As they performed, he got so caught up with the music that he wasn’t satisfied with just his hands on the keyboard. “I lifted up my foot and was playing with my feet. Then I was playing the organ with my whole body.” The crowd-pleaser helped the band loosen up and “set me off as a musician.” Even today, he will sometimes break into dance during a performance. The Bahamas may have formed Lovey’s stage style, but his music and writing is all TCI. When he moved back to North Caicos in 1976, he switched to guitar and began composing songs about his homeland and performing locally. This is the period in which he developed what he calls combina music, a blend of country, reggae, calypso, rock-and-roll and gospel . . . “and a little soca, with a disco beat and merengue,” he wrote in one song. Lovey has recorded his music a number of times, and he continues to do so. Performance, however, is where he really shines, and TCI has been good to him in that regard. 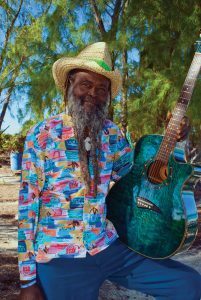 He has done regular gigs on Parrot Cay and Provo, and during the tourist season he has a weekly show at Miss B’s Fish Fry (often with his nephew, Ricky “Ricardo” Forbes) and occasional performances at My-Dee’s Restaurant, Bar and Grill and the Barracuda Beach Bar, all on North Caicos. Correy Forbes follows in his father’s footsteps. Even when he is not present, there is a touch of Lovey in the music of the Turks & Caicos, for he has influenced and supported so many other musicians as a model and mentor. One obvious example is Correy Forbes, Lovey’s son. Correy’s musical background is somewhat similar to his father’s: memories of singing in church with the aunt and uncle who raised him, Janderlyn and Victor Forbes; learning guitar and taking piano lessons before he was a teenager; solo work and composition. “I got the rudiments from Manless Taylor, my first music teacher, and I started to play keyboard with Dad in 1977. He taught me to play by ear,” he says. When Correy moved to Provo in 1996, his music took a different direction. He works primarily as a solo act, doing private engagements and only two public shows a week (in season) at Grace’s Cottage (the restaurant at Point Grace) and the Alexandra Resort. And while he still promotes island culture, he now leans more toward dining music, American folk and some political lyrics (“Back to Lemonade”). Like Lovey, he is making a living from music in a place where doing so is difficult. Lovey’s influence also extends to other young musicians, most notably the Grand Land Band of Middle Caicos. Lovey “discovered” the band one night at Brody’s on Middle. “I enjoyed their sound and asked them onto my show coming up on Horsestable Beach,” he relates. The fledgling group still had no name, so Lovey and the father of one band member brainstormed and came up with a name to echo an old moniker for Middle Caicos. He acts as an adviser to the group and occasionally performs with them. While recording is increasingly a difficult prospect for local musicians—Correy comments that YouTube and the Internet have essentially killed recording, especially for the emerging independent artist—Lovey continues to record occasionally, and generally includes other musicians when he does so. 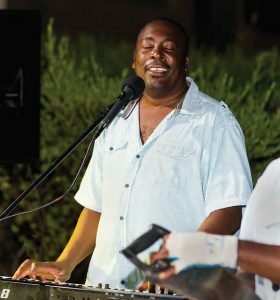 He plans to do his next recording at the studio of William “Bullfrog” Delancey in Bottle Creek, and he is among the TCI Entertainers on “A Taste of the Turks & Caicos,” a compilation CD for tourists. Others on the CD are Correy, Quinton Dean, Noel and Tiffany Browne, Keno & Kaz, Arnold Simmons, Brentford Handfield, Max Clare and Julian Garland. Even island dogs benefit from Lovey’s music! One of his “in the works” projects is a CD of potcake songs that will benefit The Potcake Foundation, a nonprofit charity founded by Heather Simpson-Forbes. Service to his community doesn’t end with music and musicians. Through the years, Lovey has quietly taken on projects to improve and beautify North Caicos, spending his own money when necessary. A park at the corner of Kew and Whitby roads was his idea, and he rallied others to help in both its creation and upkeep. A more recent project is Casuarina Garden Trails, a pleasant strolling spot next to the government’s Horsestable Beach facilities, which he rakes regularly. He plans to add benches and gardens to the site. When Lovey sees a need, he simply goes ahead and tackles it. “I realize it’s difficult to get government to do things, so if I have the money to do it, I go ahead,” he says. “Then send them the bill.” Sometimes he gets reimbursement, and sometimes he doesn’t, he shrugs. Lovey has also cut a path over Hollywood Hill so that people walking the beach during a very high tide can avoid getting wet, and he tries to keep the roads close to his property free of trash. His Whitby home is fronted by a parklike area that he created, maintains and shares freely with locals and tourists alike. It has picnic tables, a grill, hammock, outdoor showers and even some compact mini-golf courses for playing a game he invented called Circle Putt Golf. No matter what one’s beliefs are, the good that comes from Lovey’s spirit is undeniable. It is the spirit of the Turks & Caicos Islands.